This was a fun project. Red maple saplings (which grow like weeds in open fields) harvested in the spring and peeled. Then assembled into this railing. 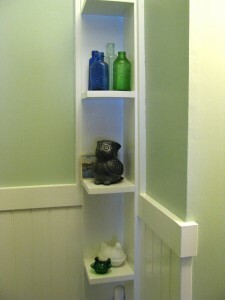 This project was begun in the summer of 2008. We chose to keep the old roof intact. 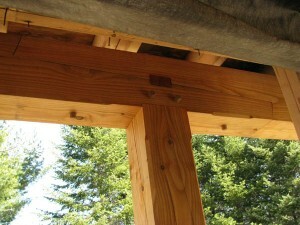 The old porch was falling down due to heaving piers, wasp infestation and general deterioration. We salvaged the old pressure treated lumber and some of the other lumber and cedar siding for use elsewhere on the property. The ceiling is insulated with the idea that one day the porch may be fully enclosed. Originally we were going to do the timber frame with reclaimed spruce but that option fell through in November. 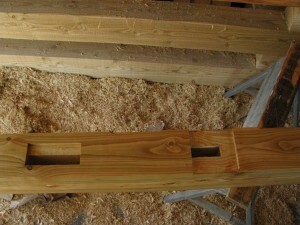 The frame is now eastern tamarack which was milled about 30 miles from the site. The frame has been treated with UV blocking oil and and oil/wax finish. The tile is 18" slate. The railings are fir reclaimed from a old granite shed and re-sawn by the neighbor across the road. All that is left now is to put up the screen door and screens. 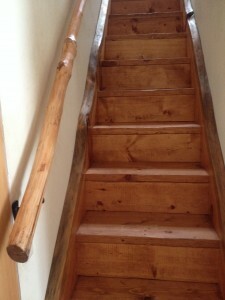 These stairs were constructed using two 9 quarter by 20 inch live edge white pine stringers. The white pine was milled up in central Vermont. Stained with a warm golden stain. Treads and risers were slotted into routed grooves. To be trimmed with hickory treads sometime in the future for final finish.